San Diego, CA has gorgeous beaches, picturesque vistas, and a huge inventory of real estate agents (17,553) and homes for sale. Finding a good agent and your surfer’s paradise in that massive pool could be tough. Luckily, HomeLight can match you with real estate agents in the top 3% of performers who, on average, sell 1.5x faster and for 5.7% more money. To find your dream shack in the sun and surf of San Diego, you need a top agent. Top agents have sold 1.8x more Spanish style cottages and beach front condos in their careers than average agents. While average agents move properties off the market in 78 days, top agents can sell 1.8x faster. Top sellers agents could make you 5.7% more to put towards a boat. Top buyer’s agents may save you 7.3% more on that La Jolla cliff-side bungalow so that you can own your favorite taco truck. Though homes in San Diego tend to sell for under asking, a top San Diego real estate agent sells for 103.5% of the list price. That’s $22,687 dollars you can spend on renovating your new home or on one of the (not) haunted rooms at the Hotel del Coronado. Just think about that sunrise! Top buyer’s agents can save you an average of $47,801 more than average agents. The best buyer’s agents in San Diego have worked 1.8x as many properties in their careers than average agents. When you find a gem among the 4,608 San Diego listings, a top buyer’s agent might save you $79,294 on the purchase. La Jolla is a small town on a cliff. Look out over clear, turquoise water while the wind whips. Downtown La Jolla has an array of small coffee shops and restaurants that add to the friendly local atmosphere. Expect to climb up and down hills to get the most of this picturesque area. 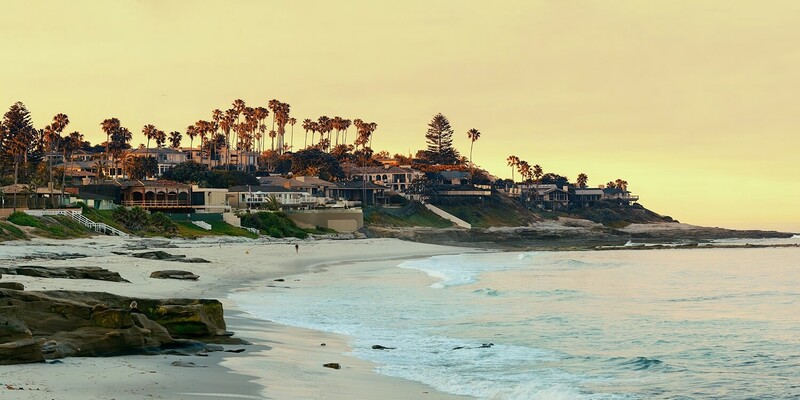 La Jolla is ideal for families who want upscale beach living and don’t mind the commute. Pacific Beach connects to Mission Beach on San Diego’s Northwest side. Filled with Sand and shops and laid back residents, PB is walkable and ideal for beach-front dining. Pacific Beach is the place for the beach-lover who wants a home with great Airbnb rental income potential. Amazing weather, great food and surf, Pacific beach is outdoor San Diego living at its best. Old fashioned and quaint, Old Town San Diego lives up to its name. Dining options are all close by, as is park space and easy access to the freeway. A train station and historic park complete its old-timey slow paced feel. Old Town is speckled with low single family homes and apartment complexes for families and busy commuters who want some peace and quiet. When is the right time to hire a real estate agent in San Diego? It's going to depend on the temperature of the San Diego housing market but we generally recommend that you hire a real estate agent as soon as you're thinking of selling your home. Generally speaking, that's anywhere from 3 to 6 months prior to your desired move date. How important is it to hire a top real estate agent in San Diego? On average, the top performing 5% of seller's agents generally command a higher selling price (+9%) than the average real estate agent. The top performing 5% of buyer's agents generally save their clients 2.5% more than the average real estate agent at closing. So, whether you're buying or selling your house, your odds of making more money on the transaction are higher if you work with a top performing agent. We encourage you to explore all of your options if you're selling a house in San Diego, CA. Why do I need to hire a licensed real estate agent in San Diego? What is the average real estate agent commission for agents in San Diego? While individual real estate agent commissions do vary, most real estate agents in San Diego work for 6% of the home price. How do I find a real estate agent that specializes in a specific San Diego neighborhood? What are the most important questions to ask when interviewing San Diego neighborhood? We've put together a list of 24 questions to ask your real estate agent. Make sure to ask them of your San Diego real estate agent during interviews. Why should I use HomeLight to find a San Diego real estate agent? HomeLight analyzes all real estate agents in San Diego to bring you custom, unbiased, data-driven recommendations. We use actual home sales transaction data to compare San Diego real estate agents and will only introduce you to the top performing agents. Do these San Diego real estate agents work for HomeLight? What factors does HomeLight consider when evaluating real estate agents in San Diego?